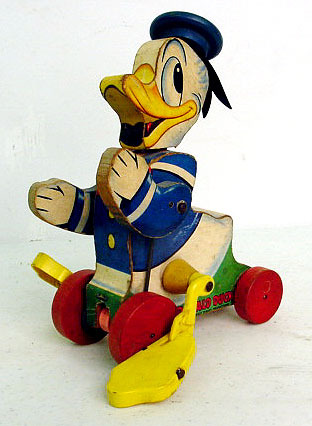 Description: This happy little Donald Duck pull toy makes Donald Duck come to life. When pulled, Donald swings his arms up and down, his legs paddle and big feet flip-flop, and Donald makes a realistic "quack-quack-quack" that sound like the real Donald Duck. FPT4379 - Wooden Donald Duck cut out with paper lithographs on the sides and edges of Donald Duck wearing a blue sailor shirt with white trim. Donald has a round blue wooden hat with a black vinyl ribbon in the back. Donald has 2 seperate wooden movable arms with paper lithographs on both sides of blue sleeves and white hands. Donald has yellow plastic legs and big yellow plastic feet. When plled Donalds arms swing up and down, his feet that flop, and a concealed voice that sounds like Donald makes a "quack-quack-quack" noise as the toy is pulled. 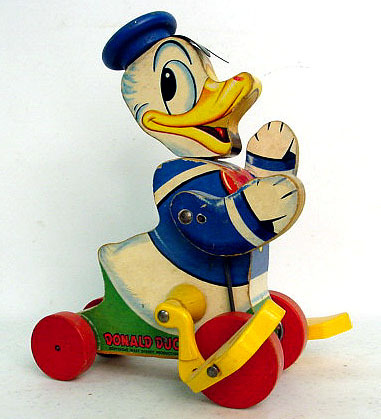 Donald rolls on 4 wooden wheels, feet are attached to front 2. Measures 6-3/4" long, 8-1/8" high, 5-1/2" wide.